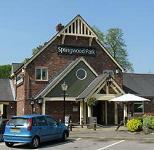 The Springwood Beefeater* pub/restaurant is part of the Premier Inn complex, this branch being known as Macclesfield north. The pub/restaurant adjoins to the right of the Premier Inn hotel. Brews: The business is part of the Whitbread group and has a selection of brews from their parent company, Interbrew. They serve a full range of eating choice from breakfast in the morning, starting at 7.00am, to lunch and dinner with choices of Nibbles & Starters, Platters, Fish, Classics, Salads & Pasta and Steak & Grills. They also offer a choice of roasts on Sundays. Webmaster’s opinion – my wife & I have eaten lunch here several times since October 2007 and the food was always of good quality, well presented and good value for money. The service was also good with efficient attractive staff eager to please. The restaurant layout is excellent for privacy with one well furnished area close to being a private room – ideal for business lunches. * The restaurant has been re-branded to a Beefeater in autumn 2017. A Premier Inn hotel is part of the same complex. Finding it: Located just off the Silk Road, Macclesfield’s bypass, at the Bollington Road roundabout (not the Flash Lane roundabout) take the turning towards Tytherington and Macclesfield. In 100 metres take the first exit at the roundabout then take the first entry to the left, and immediately left again. The Springwood complex is in front of you with the bar and restaurant entrance to the right.